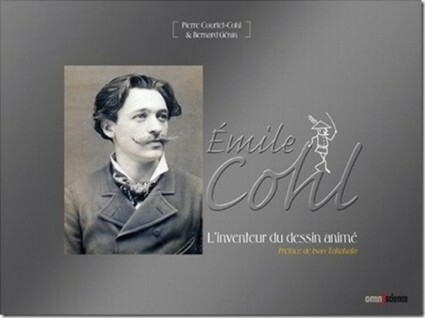 A new book on the master French animator, Emile Cohl, is due to be published in France on 20 August. The publication of Emile Cohl: L’inventeur du dessin animé, written by Pierre-Courtet Cohl (the filmmaker’s grandson) and Bernard Génin, coincides with the centenary of Cohl’s best-known film, Fantasmagorie, generally held to be the first fully animated film. The book is both a biography and a comprehensive study of his films, but what is most exciting is that it will come with a two-disc DVD, produced by Gaumont-Pathé Archives, which is said to include almost all of his surviving films (around thirty-seven are thought to survive). One cannot judge as yet whether the book will surpass the exceptional 1990 biography by Donald Crafton, which for the multi-lingually-challenged such as myself holds the inestimable advantage of being in English, but the DVDs will bring a great number of Cohl’s films out of the archives and into the public consciousness for the first time in nigh on a century (as an earlier post notes, very few Cohl films are currently publicly available). The book also has 600 illustrations, which should be more than an attraction in itself. Book and DVDs are to be published by Omniscience, which has information on book, author and subject on its site (in French), but not on the DVD’s precise contents. Update: See comments for more DVD information.